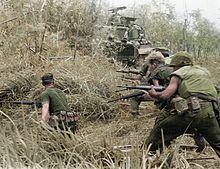 PAVN/VC forces driven from Go Noi Island and "Dodge City"
Operation Allen Brook was a US Marine Corps operation that took place south of Danang, lasting from 4 May to 24 August 1968. Go Noi Island was located approximately 25 km south of Danang to the west of Highway 1, together with the area directly north of the island, nicknamed Dodge City by the Marines due to frequent ambushes and firefights there, it was a Vietcong and People's Army of Vietnam (PAVN) stronghold and base area. While the island was relatively flat, the small hamlets on the island were linked by hedges and concealed paths providing a strong defensive network. Go Noi was the base for the Vietcong's Group 44 headquarters for Quảng Nam Province, the R-20 and V-25 Battalions and the T-3 Sapper Battalion and, it was believed, elements of the PAVN 2nd Division. The 3rd Battalion 7th Marines had conducted Operation Jasper Square on the island during April with minimal results. At the beginning of May the 1st Marine Division headquarters ordered a new operation on Go Noi. On the morning of 4 May 1968 two Companies of the 2nd Battalion 7th Marines supported by tanks crossed the Liberty Bridge (15°50′28″N 108°07′16″E﻿ / ﻿15.841°N 108.121°E﻿ / 15.841; 108.121) onto the island meeting only light resistance for the first few days. On 7 May Company A 1st Battalion 7th Marines relieved one Company from 2/7 Marines and Company K 3/7 Marines was added to the operation. By 8 May the Marines had lost 9 killed and 57 wounded and the Vietcong 88 killed. On the evening of 9 May the Marines encountered heavy resistance at the hamlet of Xuan Dai (2), after calling in air strikes the Marines overran the hamlet resulting in 80 PAVN killed. ^ a b c d e f g h i j k l m n o p q r Shulimson, Jack (1997). U.S. Marines in Vietnam: 1968 The Defining Year. History and Museums Division, Headquarters, U.S. Marine Corps. p. 328. ISBN 0-16-049125-8. ^ Kelley, Michael (2002). Where we were in Vietnam. Hellgate Press. pp. 5–150. ISBN 978-1555716257.